There’s lots of competition for tasty food and good value in Little India, so the fact that Komala’s has been open more than 50 years and is always busy speaks for itself. This South Indian restaurant has implemented a fast food-style ordering system to deal with the steady stream of customers, but the food remains fresh, flavourful, and 100% vegetarian. The menu is posted on the wall at the ordering counter and options range from S$2.40 for a plain dosai (lentil crepe) to S$7.80 for a full meal with yellow biriyani rice, an assortment of curries, raita salad, and a drink. 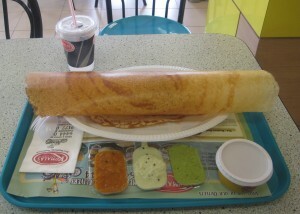 One of their specialties is bhaturra, a big puff of lightly fried dough served with chickpea curry, but my personal favourite is the masala dosai, a lentil crepe stuffed with curried vegetables and 3 dipping sauces on the side. The paper lining on the meal trays lists the nutritional information for most menu items; the food may be pure vegetarian, but the coconut sambal sure packs a lot of calories. Since Komala’s is right beside Mustafa Centre, the restaurant sees plenty of tourists and automatically provides plastic utensils. If you’re up for a challenge, try eating Indian-style using only your right hand – eating rice with your fingertips is harder than it looks. There are sinks for washing up before and after your meal. The food is tasty and pretty authentic, but I wouldn’t go so far to say Komala’s is the best vegetarian restaurant in Little India. Rather, this is the kind of place you choose because it’s clean, convenient, and you know exactly what you’re getting. 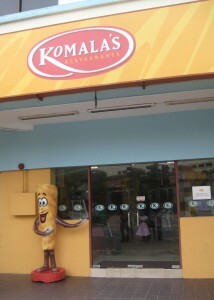 If you’re new to South Indian food Komala’s is a great place to get acquainted. In addition to the Little India location, you can find Komala’s Restaurant at Peninsula Plaza, Raffles Place, East Coast Park, and Suntec City Mall. Take-away is available and they deliver for orders over S$20. See below for more places to eat and drink at in that are listed on Travelfish.org. Are you supposed to tip in Singapore?